We are back after our Lenten break (it wasn’t as restful as it sounds!). Don’t forget we are offering a two-part webinar on Composition which begins this Wednesday. Writing is one of those areas, like science and math, where parents are afraid to depart from traditional schools’ methods. Sadly, parents hold on to these old practices, even while admitting they didn’t learn how to write well themselves and had such negative experiences that they dread teaching composition to their own children. These fears drive them to adopt a curriculum or hire a tutor, and the shinier and more expensive the more it allays their fears (they think). Charlotte Mason offers us another way, just like she does for the study of history and art and nature. We can lead our children in paths of delight, where writing becomes second-nature, something that must burst forth from the inside out. A student who is passionate about an idea, and has followed Mason’s course of study, can express their thoughts with precision and care. Join us for this Two-Session Webinar Bundle for just $20. From Oral Narration to Composition with Amy Snell. Session One. Preparing for Written Narration in the Mason Method. What steps should you be taking from the earliest years to help your student develop good communication? Is just “Oral Narration” enough? How can you make the most of transcription, notebooks, and dictation to scaffold your child for written narration. And what about the kids in my neighborhood who are writing “the Five-Paragraph Essay” in 5th grade? This workshop will cover the elements of strong writing and how they can become a natural and enjoyable part of your child’s life. Session Two. The Nuts and Bolts of Written Narration. With Mason’s philosophy and methods you don’t need a separate writing curriculum to achieve good writing and real learning! In fact, Mason believed Composition lessons should be avoided! This doesn’t mean, however, that she didn’t have definite ideas about how students should learn to write. This session will tackle the common questions and give you the practical information you need for good writing. -As a former high school and college English Literature, public speaking and composition classes for students of many learning types and ability, including special needs and honors, Amy knows what good communication is all about and what is expected at the highest levels of writing. -Implemented narration in a wide variety of classes and subjects, including artist study, Plutarch, and Shakespeare and so has led narrations in a wide variety of forms, varying according to the subject taught. Narration is narration and yet a science narration differs from one in literature or history or artist study. -Worked with children who’ve just begun Charlotte Mason as well as those steeped in the method. -Guided parents and mentored teachers at The Mason Academy (a K-12 blended model school in the Philadelphia area) in implementing narration at home and in the classroom. -Uses Mason’s practices on a daily basis with her own five children in their home schoolroom. One of the best features of the Bullet Journal is that it is a catch-all for your notes, your menus, your ideas. Rather than keeping separate notebooks for all of these things, it’s all in one place! This means that if you are working on your calendar or daily to-do list and your brain wanders to your meal plan or your child’s birthday party or your Christmas wish list, you don’t need to get your computer, an app, or another notebook, you just turn the page. 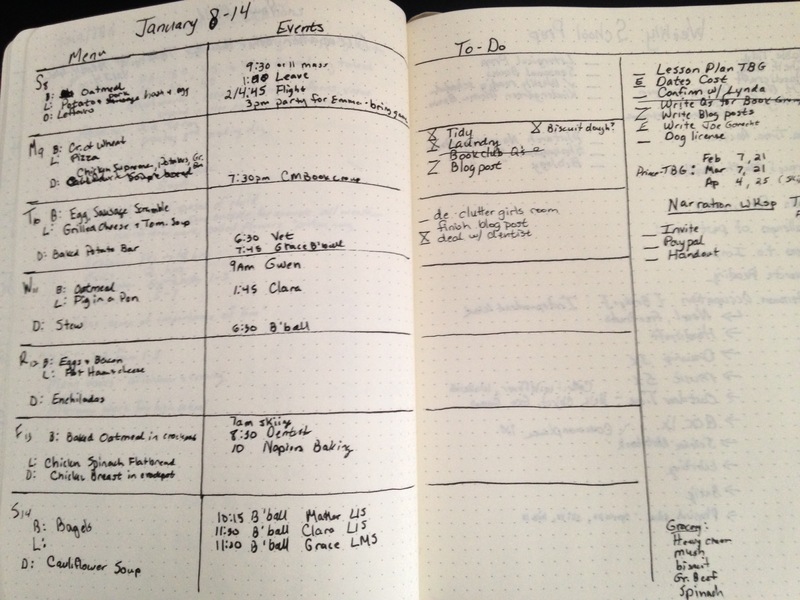 This is the key to becoming better organized and being able to track so many things. These special pages in Bullet Journal lingo are called “collections.” For the full explanation of collections, visit the official bullet journal site. Basically, anytime you have “notes and tasks that are related by a common theme or purpose” you can start a collection. Because these collections are right there with my calendar and menu plan and the rest of my life, I turn to them much more frequently then if I kept them in another notebook or on my computer. So what collections do we keep as homeschooling moms? Our School Children’s Book and Supply List. I organize by subject and I put the book on the left and the supplies needed for that subject on the right. This way I don’t forget that I need a map of Ancient Greece or I need rulers for Paper Sloyd. Our Morning Timetable. This schedule is fixed at the beginning of the year and is only tweaked a bit. I create my time-table based on Charlotte Mason’s programs and I use the Schedule Cards created by Nicole Williams to do it. Books Wish-List for my own personal reading. You know, Mother-Culture! The beauty of this is I have my list with me when I’m out shopping or at the library. As soon as I hear a book recommended or one I’m interested in, I jot it down as part of this collection. I think this helps me spend less money too, because I use to go immediately to amazon to add it to my wish list there but would often decide to just buy the book! Now I do less impulse shopping! I like to keep a log of books I read over the course of each year. I categorize them by Evening Read Alouds, Fiction, and Non-Fiction because at one point I found myself reading books to the kids that were fiction and reading primarily non-fiction (usually education, parenting, and home related) when I was reading alone. 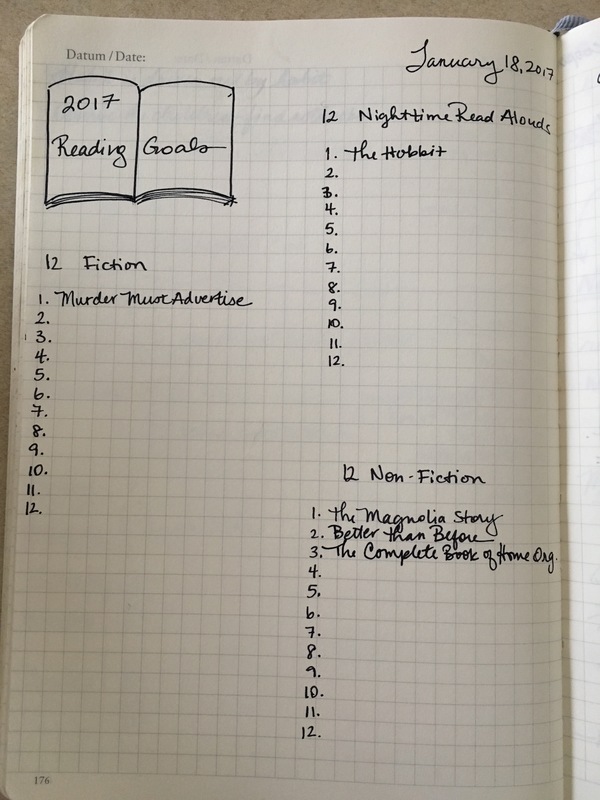 I wanted to add more fiction so I started tracking it, and I’m thrilled to say I read 8 great fiction titles last year. Our Habits. Every few weeks we add a habit we are working on. With 5 children and me to track, it’s very helpful to keep a page of the current habit each person is working on. Rainy Day activity list. This PR article mentions the idea of having a shelf of toys and activities for children that they just get to do on “wet-days” when they can’t be outside. This led me to create a “collection” of ideas not just for wet-days, but any day that we seemed in a funk. I don’t have many of these, but I did make one for our family games and I love it. Now, if we want to have a game night or the kids need an indoor activity, I can suggest a specific game without leaving my spot. Sub Plans. This is along the lines of the rainy day list, but is for any day I’m not feeling well enough to teach. No, sadly, I don’t have a substitute teacher, but I have found it helpful to have a time-table of the types of school activities that the children can do without me. AKA, true self-education days!! Book of Century List. We add to our Book of Centuries/Century Charts in the afternoon time-table, not immediately after each morning reading. I found that the children had a hard time remembering who they wanted to add by the time the afternoon rolled around, so now if they think of someone they want to add, we add the name to this collection. Check-lists for Activities. Don’t you hate running out the door for a co-op or nature club and trying to remember everything you need? I have a heading for each activity and a list of all that we need to do and all we need to bring. So helpful! This way we don’t forget our water paint brushes, tick-spray, matches, water bottles, magnifying glasses, binoculars, compass, etc. along with our Nature Journals when we go to Nature Club. Planning Routine. I plan to plan! It’s true. I have a list of what I need to do each night for the next morning. Each weekend for the following week. Once a month for the next month. 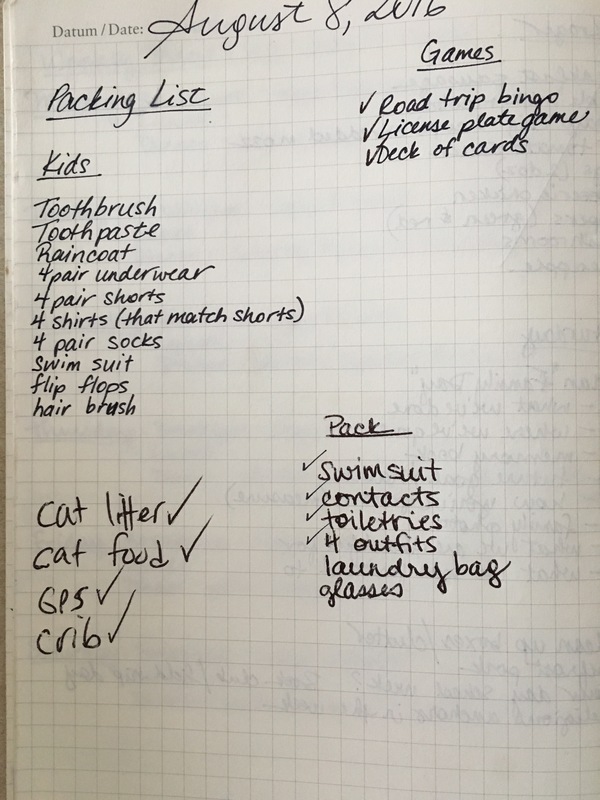 Whether it is a weekend away or an afternoon Nature Study Club, I write down the items I want to have with me and check the list before I start packing up. Education/Parenting: Of course, Mason, but I also enjoy reading popular books on parenting and education, along with a classic tome, now and again. Culture: A book on our Artist or Composer we are studying. Nature: Sometimes on our Special Study topic, other times our Nature Study, sometimes books on Nature and Children. Having a list like this, spurs me to keep my “Mother-Culture” going! Would you like to learn more? To see some of these collections and pages “live”? Sign up for our Bullet Journal for Homeschooling Moms Webinar, now just $10! Camille and Amy will walk you through setting up your bullet journal and maximizing its potential for homeschooling! We look forward to “seeing you” there! At the heart of the Bullet Journal is the daily log. This is the page that stays open all day to keep us on track. 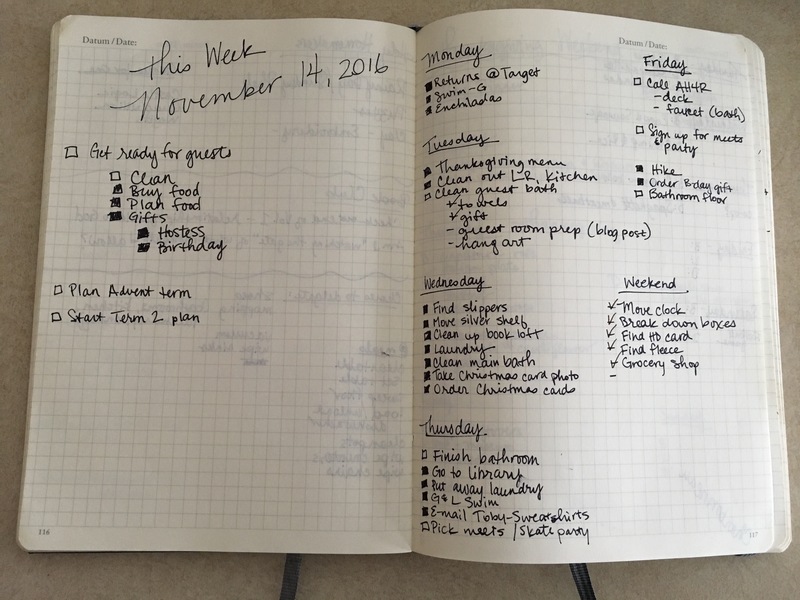 Camille and I have tried the many ways of keeping a daily log/weekly spread. Today we are sharing our favorites with the hopes that you will see the flexibility of this method and maybe even find one that fits your life! There are two things we need to live a more organized and peaceful life: resolution and method. “The real truth with most of us is that it requires a little more resolution and a good deal more method than we possess to so arrange and carry out the work of the day… (The Parent Review, “Simple Things” by S. F. S.Volume 12, no. 12, 1901, pgs. 958-960). The Bullet Journal is such a method to arrange and carry out the work of the day! And when we have a method the resolution becomes easier and easier. The method is our way of laying down the rails and then finding freedom. So often we have the resolution but not the method to fulfill it! But back to the weekly spread! Home: Everything that relates to our family life! Reminders to make a dentist appointment, call someone back, send an email, an idea I want to explore. Work: Everything that relates to my Charlotte Mason initiatives: CM Reading Club, Nature Club, Truth, Beauty Goodness Symposium, the Charlotte Mason Educational Center of PA.
Liturgical Year: I take the time to note any important feast days for us to celebrate that week. This particular week I reminded myself to prep for our All Saints Day celebration and then created a separate page for planning. Grocery: This isn’t my grocery list, but where I jot down if I notice we are out of one our pantry staples. You know, the things that nag at you but you always forget when you actually sit down to make your grocery list. This week I noted we were running low on tea. Errands: This is a list of the out-of-the ordinary things I might need to pick up or drop off during the week. This week it was a birthday gift for my daughter’s friend. Then on the right is my weekly list. First, I write in all of normal weekly events, like basketball practice, choir, violin lessons. Yes, these are on my Google Calendar that I share with my husband and yes, they repeat every week, but I still write them out each Sunday night. When I do so, I feel like I really get a hold of the week and feel so much more at peace. My next step is to then migrate things from the left page over to the right on the day that actually makes sense for me to do them. 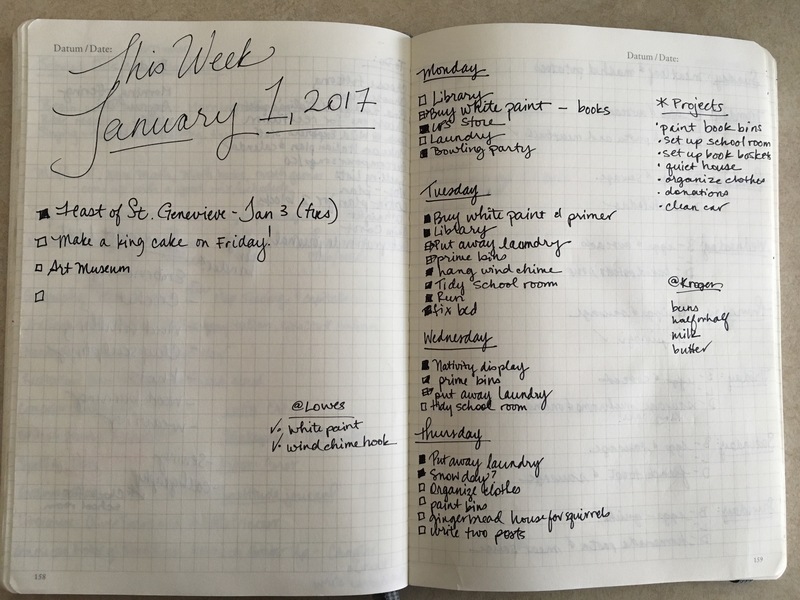 Its only after doing the brain dump on the left and then filling in our normal weekly events that I can accurately plan when I can do what needs to be done! Just recently I switched to a new spread and I really like it. I love that my menu, my events, and my to-do are all on one big spread and then I have a column on the far left for my brain dump. 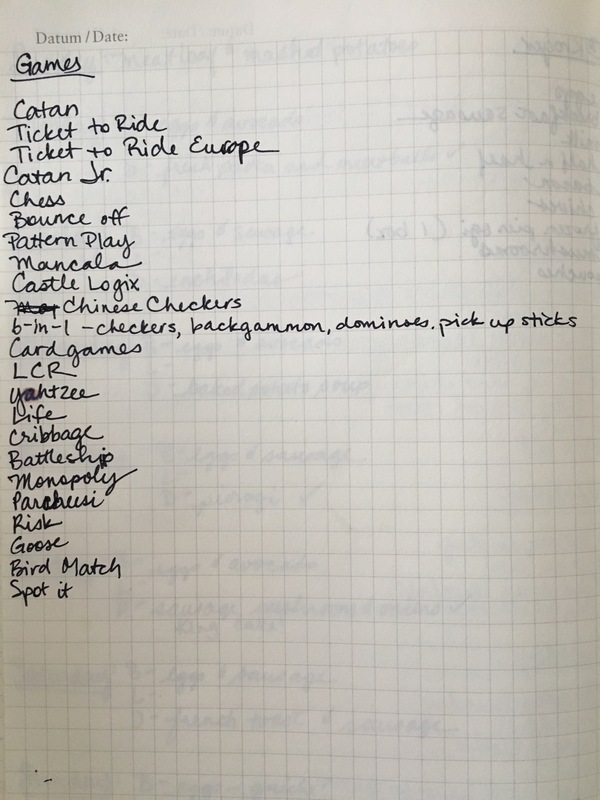 It’s small but I found I don’t need a ton of space for the brain dump and that I usually want to create a whole page for many of the items anyway. My main spread that I could not get through a week without is relatively simple. I always set this up on Sunday afternoon or evening in preparation for the week ahead. I happened to take a photo during a school break week, so I’ve also included one for a school week, though I don’t make a lot of school notes on my main spread. First, I make a mini brain dump of things I want to remember, do, or accomplish that week. In the first example, my daughter had a feast day that I wanted to remember because for two years in a row we have either forgotten or been travelling so it could not be properly celebrated. I wanted to make sure we had time to let her choose dinner and dessert, as well as time to buy the ingredients needed, if any. It was also epiphany week and I wanted to remember our king cake. We had also been gifted a membership to the art museum and I wanted to go before school started up again. I then start up a list of what I can reasonably accomplish the following day. Not grand hopes of things to accomplish, but realistic plans. These smaller lists for each day also include smaller tasks that need doing, such as errands, a reminder to put away that basket of laundry (so I can’t claim I forgot it…), or phone calls and emails that need to be made. This particular week, being a week of no schooling, I also had a list of projects I wanted to complete, which is an unusual addition. In the following spread, you’ll see that while the format is the same, the usefulness changes because I was beginning to prepare for Thanksgiving guests, planning my Advent Term as well as Term 2 for school, and I had a lot of small tasks that needed to be taken care of such as phone calls and errands. While this is my home base spread for the week, it expands as these tasks get carried out. For example, I created new spreads for school planning, as well as my Thanksgiving menu, and gifts that needed ordering for birthdays, hostess gifts, and Christmas. Now, the other part of my Sunday afternoon routine is menu planning, but it doesn’t fit on my main spread and gets one of its own. That is a post for another day! We hope you enjoyed this sneak peak into our lives and found it helpful! Please share below any questions you have below! Next week we will be sharing with you all the Collections we keep as Charlotte Mason moms. Subscribe so you don’t miss a post! Would you like to learn more about keeping a Bullet Journal? To see some of these collections and pages “live”? We here at Learning How to Live love the method of the Bullet Journal for planning, collecting, and organizing. The longer we use it, the more we use it. The more we use it, the better at “life” we get. A PRACTICAL GUIDE TO THE BULLET JOURNAL! We’ll show you how the Bullet Journal works for managing our homes, our personal goals, our money, our menus, our life. We’ll blog on how the Bullet Journal fits so naturally for homeschool planning–book lists, future goals, evaluating our children. It especially works well for a Charlotte Mason approach! We’ll write about how the Bullet Journal has simplified our routines, organized our lives, and helped us find peace. But first, we want to talk about why the philosophy behind the Bullet Journal fits with the way we see the world. Like so many of our readers, as we’ve read Charlotte Mason’s life-giving philosophy of education, we’ve learned principles that haven’t just made us better teachers and parents, we’ve become better humans! So principles first, then practices for a cohesive, integrated whole! Why is the Bullet Journal such a useful and revolutionary, yet simple way to get a hold of your life? We believe that its success is because it’s a method, not a system. The Bullet Journal is a method, not a system! Charlotte Mason writes on the importance of method vs. system in education and her ideas are all of the same reasons the Bullet Journal works. So what’s the difference between a method and a system? A SYSTEM is a machine, like a bodies, like a factory conveyor belt, that breaks down when it comes into contact with our very real, very human life. We are not cogs in a system; we are persons! A METHOD, like a system, is way to achieve a desired end, yet it provides for “the vital growth and movement of a living being” (Volume 1 page 11). Method implies two things––a way to an end, and a step by step progress in that way. Further, the following of a method implies an idea, a mental image, of the end of object to be arrived at. What do you propose that education shall effect in and for your child? Again, method is natural; easy, yielding, unobtrusive, simple as the ways of Nature herself; yet, watchful, careful, all pervading, all compelling. Method, with the end of education in view, presses the most unlikely matters into service to bring about that end…Charlotte Mason.Volume 1 page 8. We all need a way, a path, a step-by-step guide to achieve the end, the idea, the object we have in mind. This is true in education, but it also true for menu planning, party planning, homeschool planning, list-making, tracking appointments, wish lists, recording memories, collecting ideas, brainstorming for the future. If we don’t stay on the path, we will get lost in the details or lose a detail. We miss appointments, stack up library fines or forget to pick-up more vanilla and toilet paper at the grocery store. Without a method, we feel stressed and anxious. The Bullet Journal allows you to create a way, a path that is flexible, meeting your individual families needs and the way you think. The Bullet Journal is just that. A simple Pinterest search will show you the thousands of different ways people set-up all the things you might ever need to track, all in one place.You can doodle, add art and stickers, or you can be plain Janes, like Camille and me! If you need to change your weekly spread, you can! The blank page of the Bullet Journal is key. The problem with other planners, apps, or systems is that they operate on creator’s ideas but may not work with your world. Take the example of Meal Planning. 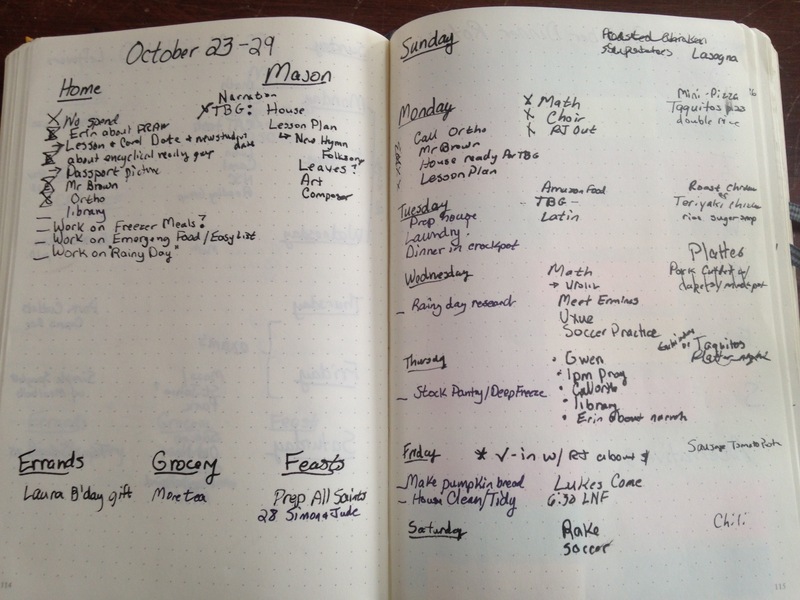 You want to meal plan and make your grocery list on the same page. You only want to plan dinners but your planner has a 3 row by 7 column grid. Or you like to have your menu list in your calendar on that day of the week, you don’t want a whole separate table, but the cells aren’t big enough to hold your to-do list, your appointments, and your menu. So you have different notebooks, papers all over the house, sticky notes, apps. You end up needing a system to keep track of all your systems! Or you just give up! We use it for everything–work, family, creativity, home-making, holidays, journalling. And it helps us to be more “watchful [and] careful”! A great example is planning for one of my children’s birthdays. When I create the monthly calendar and fill in my child’s birthday on the 9th, I immediately turn to the next open page and create a new page titled, “Birthday.” Perhaps, I also had that nagging thought that she wanted new shoes and I had an idea for a great theme so I jot them down and then head back to the calendar. The “Birthday” page is there for me to come back to and create menu plans, wish list, shopping list, RSVPs, etc, etc! With technology we can move at such a fast-pace that we often let details slip. As we are forced to slow-down and write out our plans and ideas, we ruminate on them. This plants our plans in our minds, new ideas grow, and we feel at peace. 5. The beauty of the Bullet Journal is that once you figure out your method, you can turn it into a system. But if that system stops working, you can try a different method, but you don’t need a new notebook or a different approach. The Bullet Journal allows for you to change as you need. Mason tells us that “There is always the danger that a method, a bona fide method, should degenerate into a mere system.” Volume 1 p 8. Since the Bullet Journal is just a blank book, we can always turn to the page and start again as we need. After trying different weekly spreads, for example, I have one I mainly stick to week after week, but if it’s a very different week, Christmas or illness, I can change it up easily. Method…aid[s] the many sided evolution of the living, growing, most complex human being; but what a miserable wooden system does it become in the hands of ignorant practitioners! We are living, growing, complex human beings. In the Snell home, there are 7 of us, living growing, complex human beings! No wonder wooden systems have failed before. If a human being were a machine, education could do more for him than to set him in action in prescribed ways, and the work of the educator would be simply to adopt a good working system or set of systems. But the educator has to deal with a self-acting, self-developing being… (Volume 1 page 10). Thus, a bullet journal is needed. So how do we Bullet Journal? What do we recommend? Would you like to see how we keep track of our curriculum as Charlotte Mason mamas? Subscribe today so you don’t miss out future posts!